Absalon's Arch of Roskilde Cathedral. When people talk about traveling to Denmark, they usually mean Copenhagen. Don’t get me wrong, Copenhagen is an awesome city and I loved every minute there. But when I was researching our trip to Denmark, I read about Roskilde, and I felt kind of sorry for Roskilde. Why would somebody stay in Roskilde when Copenhagen is so close by? The more I read about Roskilde, the more I felt sure Roskilde would actually make a really good home-base for some of our Denmark travels. So even with its close proximity to Copenhagen, we decided to give Roskilde a try, and I’m glad we did. Centuries of Danish architecture on display at Roskilde Cathedral. There are a lot of interesting churches in Denmark. 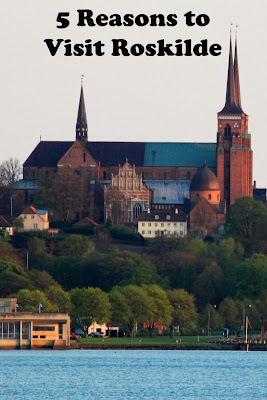 But if you were only going to visit one church in Denmark, Roskilde Domkirke, or Roskilde Cathedral, would be the one. Roskilde was such a powerhouse back in the day it was able to support Denmark’s Cathedral. The first church on the property was built in AD 980 by Herald Bluetooth. It was replaced by a stone church in the 11th century, the foundation of which is below the present day cathedral. Today’s cathedral was built in the 12th century, but with many architectural additions in the following centuries. Roskilde Cathedral's choir and altarpiece. We’ve been to a lot of cathedrals during our travels, but Roskilde Cathedral is one of the most fascinating we have ever visited. It is also a UNESCO World Heritage Site. Everywhere you look there is some sort of unique decorative feature. Thirty-nine Danish kings and queens are buried in Roskilde Cathedral, all in very ornate yet incredibly different tombs and in multiple chapels. It is even believed Viking king Herald Bluetooth is buried in Roskilde Cathedral. Christian 4's coffin in Christian 4's Chapel. One of Denmark’s most important kings was Christian 4, the builder king. He was responsible for many of the structures throughout Denmark that are still around today. After his wife died in 1612, he ordered the construction of Christian 4’s Chapel. Part of the plans for the chapel included a sepulchral monument which was destroyed a year before his death when the arsenal in Copenhagen burned. Ironically, after providing so much to his country, there was no money left for decorating the chapel when he died and the decoration was not completed until 1886. The Chapel of the Magi. Another impressive chapel is The Chapel of the Magi, built by King Christian 1 around 1460. The chapel was devoted to The Society of the Mother God, which later changed its name to the Elephant Order and still exists. Christian 3 and Frederik 2 are also in this chapel. The chapel walls and vaulted ceilings are covered in 15th century frescoes and within the chapel are huge and ornate tombs surrounded by statues. In the middle of the chapel is a central pillar tracking the heights of members of royalty. Be sure to put aside enough time to thoroughly explore Roskilde Cathedral. There are numerous chapels along with random rooms to peek into and many nooks and crannies. I suggest two hours. Before Copenhagen there was Roskilde. During the Viking Age, Roskilde was Denmark’s capital and an important port. Roskilde’s Viking Ship Museum contains Viking ships that were excavated from the bottom of the Roskilde Fjord. The ships were actually sunk on purpose in order to block one of the three passages during the period 1060 to 1080. It is believed the ships were sunk to protect Roskilde from invasion. After being sunk they were piled with stones to create an underwater barrier. Roskilde’s Viking ships were excavated in 1962. When you visit the museum, be sure to watch the informative film explaining the excavation and preservation process as well as the story of sailing a reconstructed Viking ship from Roskilde to Dublin. The fascinating preservation process involved soaking the wood in glycol until the glycol completely replaced the water in the cell structure of the wood. Some boards took years to preserve. There were five different types of Viking Ships scuttled. Skuldelev 1 was an ocean-going trader built of pine in Norway. Skuldelev 2 was a longship, or an ocean-going warship, built near Dublin around 1042. It is the largest of the group. Skuldelev 3 was a coastal trader made of Danish oak that would have been used by a farmer. Skuldelev 5 was a small longship made of Danish oak, ash, and pine and would have been the smallest longship in a war fleet. Skuldelev 6 was a fishing vessel built from pine in Norway and was probably used for whaling or seal hunting. The Sea Stallion from Glendalough, the reconstruction of Skuldelev 2. In addition to the preserved ships, the Viking Ship Museum has displays about the Viking Age, and outside are reconstructed Viking Ships and exhibits of Viking tools and demonstrations of Viking techniques. During the summer months the museum runs boat trips in traditional Nordic boats. Smørrebrød at Gourmethuset Store Bors. Roskilde doesn't have the slew of Michelin-starred restaurants Copenhagen has, but it still has really good restaurants. Gourmethuset Store Bors is near the harbor and Viking Ship Museum. The restaurant is in an unassuming cottage but serves some of the best food in town. We stopped in for a lunch of smørrebrød and local beer. They smoke their own fish and use fresh herbs from their garden. Raadhuskælderen is located in the cellar of the old city hall and serves traditional Danish food for a very reasonable price. It’s a busy restaurant, as it is popular with the locals. The menu had some very good flavor combinations and unique dishes. Restaurant Vigen is across the water from the center of Roskilde and is a beautiful place to see Roskilde from a distance and take in the sunset. Restaurant Vigen is where you want to go for a final meal in Denmark or a special occasion. The cuisine is modern Danish. Fine dining at Restaurant Vigen. The view of Roskilde from Restaurant Vigen. At the end of our trip we wanted to be near the airport, but we didn’t want to stay in Copenhagen again. Hillerød, Helsingor and Humlebaek, three important towns of north-eastern Zealand, are just as easy to reach from Roskilde as they are from Copenhagen and are destinations not to be missed. Attractions in these towns include an incredible castle, a magnificent maritime museum, and one of Denmark's important modern art museums. When it’s time to go home, Roskilde is only a half hour's drive to the Copenhagen international airport. The quiet beauty of Roskilde at night. I can’t really put my finger on why, but I just loved the overall feeling of Roskilde. It isn’t as large or cosmopolitan as Copenhagen. Even with a crazy cathedral in its center it feels like an everyday city filled with everyday people. I was so drawn to Roskilde I could even see myself living there. Walking around at night the cobblestone streets were fairly empty, but looking into the windows of bars and restaurants we could see people enjoying life and hanging out with friends. During the day, while strolling along streets lined with shops, we stumbled upon random works of art and found ourselves at the gates of a beautiful cemetery. Yet Roskilde didn't feel like a fairy tale destination, it felt real. In the end, it was the feeling I got being in Roskilde that made me love it, and that’s just something you’ll have to experience yourself. Most visitors to Roskilde come on a day trip from Copenhagen. But if you’re visiting more than Copenhagen on your trip to Denmark, I suggest staying in Roskilde for a few days. My only regret is not having stayed a little longer.